Borussia Dortmund v Mainz — In the end, it was a hard-fought victory for Borussia Dortmund. 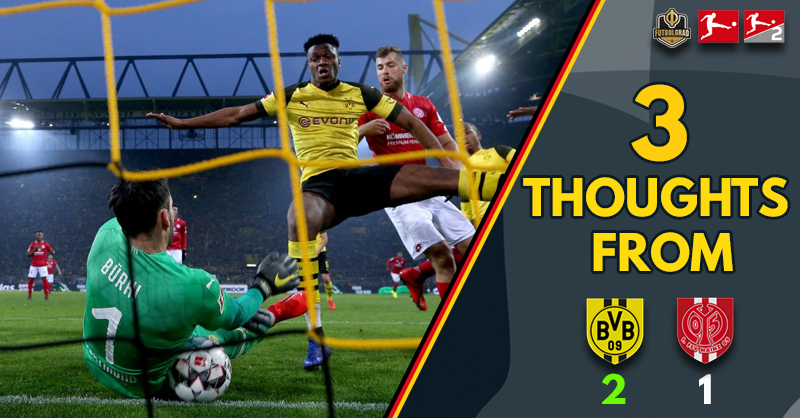 The Black and Yellows were dominant in the first 45 minutes with Jadon Sancho scoring two quick goals, but in the second half, Mainz dominated as Dortmund barely hung on for the victory. There was plenty of talk about Marco Reus playing as a number 9 against Bayern München a week ago. “Everyone knows I don’t like to play there”, Marco Reus said after the game. With Paco Alcacer once again injured Dortmund head coach Lucien Favre opted to play Reus up front instead of Götze. That turned out to be a mistake, a mistake that Favre did not repeat this weekend. Götze started as a false-number 9 against Mainz and assisted Sancho’s first goal. With his movement Götze, in many ways, might be the best forward in Dortmund’s squad at the moment, especially with Alcacer continuing to struggle for fitness. Now Favre just needs to stop second-guessing himself and to keep playing Götze up front. Jadon Sancho was once again excellent. The 19-year-old Englishman became the youngest player to score 11 goals in the Bundesliga. That might seem like an arbitrary number used by stats guys to underline Sancho’s value. Kai Havertz was previously the youngest player to reach this number, which just further underlines Sancho’s worth to Dortmund. “We knew today was going to be a tough game. Obviously, minds have been racing recently. Yeah, we played well first half and the two goals were really important for us,” Jadon Sancho said to the press after the game. 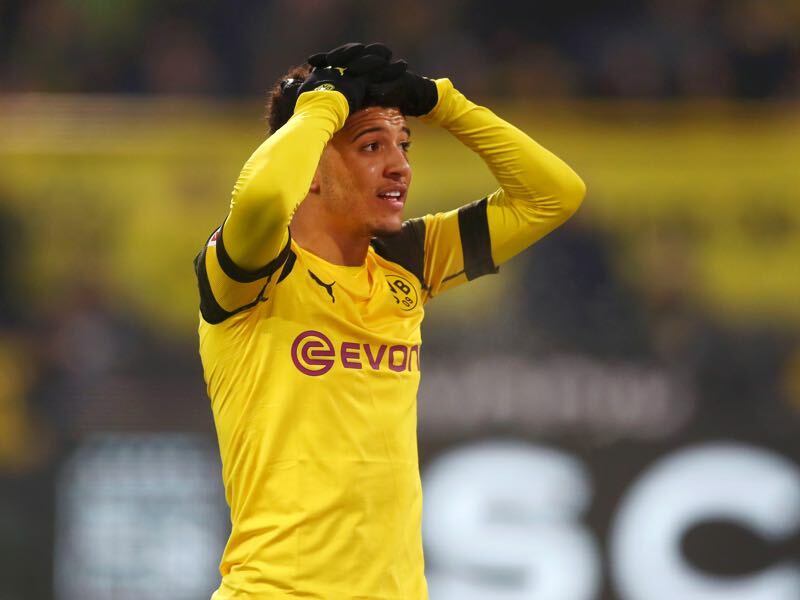 Sancho in some ways reflected the entire Dortmund side. Brilliant in the first 45 minutes were the Black and Yellows should have scored several goals and a bit of a drop in form in the second 45. “Second half everyone dropped really. So now our work is on how to keep the momentum going second half,” Sancho added. Nerves in the title race, or simply hard work? “Yes, of course, we never stopped to believe in some point to get here we know it sounds weird because they are second of the table and after 2-0 it is hard if you push,” Mainz wing-back Giulio Donati said after the game. In other words, Mainz knew that Dortmund are vulnerable at the moment, even with two goals up. The Black and Yellows, however, had only themselves to blame for not finishing the game in the first half. Countless, chances were left on the line, which gave Mainz a lifeline overall. “Our games are always close. It will be this way in the following months. Mainz were clearly better in the second half, but we kept the three points. Was it hard? Of course,” Favre told the media after the game. Favre’s Dortmund have 66 points after 29 games, their second-best record in Bundesliga history. Their best record at this stage came in 2015/16 (68 points) when Thomas Tuchel guided them to a second spot. Furthermore, on Saturday on Mainz Dortmund ran the most kilometres (126.7) since the statisticians started to collect the statistic in 2011. Right now the title fight is not pretty but hard work, but nobody will complain if it turns out to be enough.